A fly or bush camp is a lightweight campsite set up exclusively for your party. 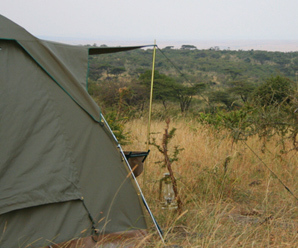 It carries the minimum requirements for a comfortable night, but the emphasis is on the experience of cooking dinner around the campfire, enjoying the sounds of the night, and sleeping in a lightweight tent out under the stars in the Masai Mara. If you have booked two or three nights in the main camp, then spending a night in a fly or bush camp is always a worthwhile and rewarding experience. Falling asleep in your bush camp while listening to elephants splashing in the river, or waking up with a herd of buffalo on your doorstep is an unforgettable experience. Sitting in the bush, stoking the fire, and watching the sun dip behind the African plains over the Masai Mara ecosystem rings true of the authentic safari experiences of old. It is here, in this space, that you will feel entirely detached from the rigours of modern society and the stresses of everyday life.